We spent the day at the Chicago Art Institute. It was a bit rainy, but no ma. We ate breakfast in the hotel and it was less than two blocks to the museum. We’ve been to this art museum before, but it’s so fine that visiting it again was sublime. 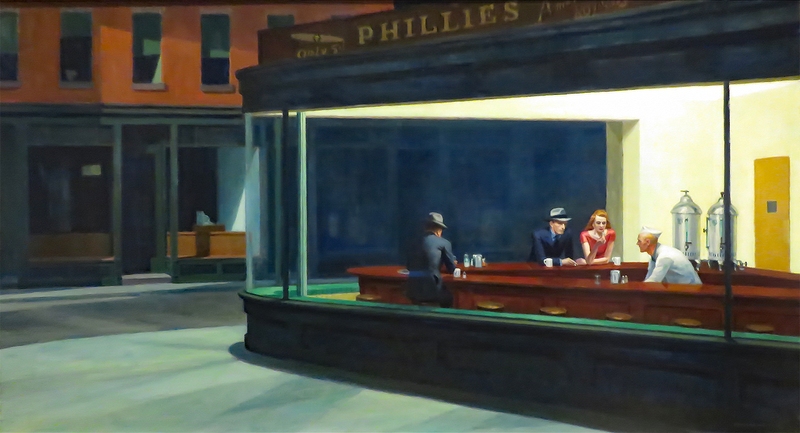 Hopper’s painting is a family favorite and although he set it in NYC, it wears well here in Chicago too. We walked the night-hawk life ourselves tonight. Normally, i.e. yesterday, we’ve been back in our room by sundown. You can’t really count Monday, because the train was so late, we never could have been in-house before sunset. There is danger here after dark. Murder, assault and robbery abound. Read the news. Listen to our President. He knows. I know that he has been here. He left one of his towers down the street. Risking all, we stepped out for the night. Our destination, Art on the Mart. We are staying inside the Loop, which is not the same as being in-the-loop, but we walked outside the Loop, which is not the same as being out-of-the-loop. The Mart is Chicago’s furniture market. It’s the country’s second largest building, by floorspace, second only to the Pentagon. All that floorspace creates quite the façade, when crammed into two blocks, especially fronting on the Chicago River. 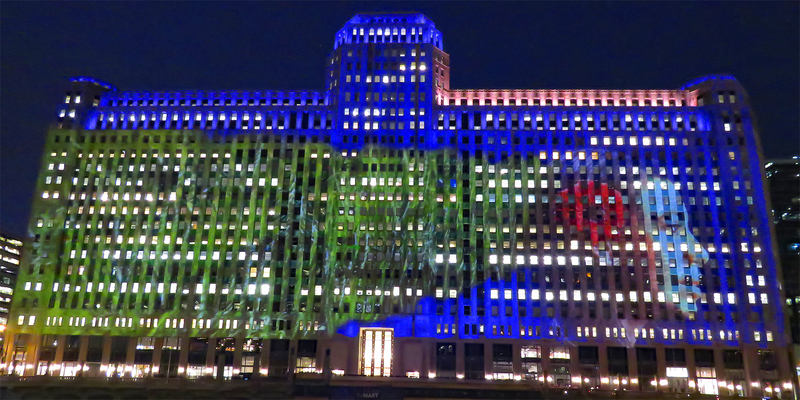 We viewed the light show from across the river, above the projectors. Hooper’s painting is reason enough for me to go there!